[S858] Allison Elizabeth Avery Powers, "NSDAR: 838321, Allison Ellizabeth Avery Powers." [S807] Find A Grave, online http://www.findagrave.com, Find A Grave, database and images (https://www.findagrave.com : accessed 10 December 2018), memorial page for Annis Hayes Rice (17 May 1777–20 Feb 1845), Find A Grave Memorial no. 64245403, citing Granby Cemetery, Granby, Hartford County, Connecticut, USA ; Maintained by M Cooley (contributor 47154454) . George B. Austin was born on 18 August 1836 at Sacketts Harbor, Jefferson Co., NY. He was the son of Benjamin F. Austin and Lois Louise Baxter. George B. Austin married Mary Barnum Drew. George B. Austin died on 31 October 1917 at Roseburg, Douglas Co., OR, at age 81. 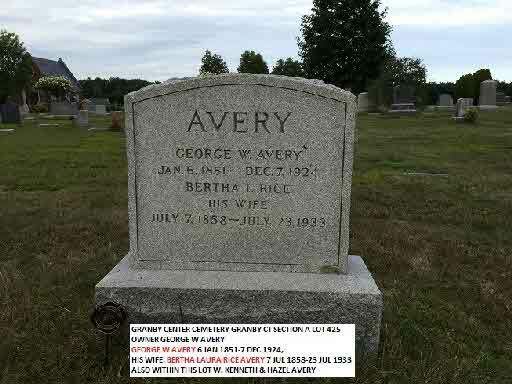 [S807] Find A Grave, online http://www.findagrave.com, Find A Grave, database and images (https://www.findagrave.com : accessed 11 December 2018), memorial page for Bertha Laura Rice Avery (7 Jul 1858–23 Jul 1933), Find A Grave Memorial no. 64166404, citing Granby Cemetery, Granby, Hartford County, Connecticut, USA ; Maintained by M Cooley (contributor 47154454) . [S35] 1900 Federal Census, unknown repository address, Year: 1900; Census Place: Granby, Hartford, Connecticut; Roll: 136; Page: 1A; Enumeration District: 0138; FHL microfilm: 1240136. Sidney John Thompson was also known as John Sidney Thompson. He was born on 2 April 1836 at Hampden, Hampden Co., MA. He married Emily Jane Cowdrey, daughter of Phelps Cowdrey and Emily Holcombe, on 29 November 1860 at Granby, Hartford Co., CT. Sidney John Thompson died on 28 October 1918 at Boston, Suffolk Co., MA, at age 82. George Ambler Thompson was born on 16 August 1862 at Springfield, Hampden Co., MA. He was the son of Sidney John Thompson and Emily Jane Cowdrey. George Ambler Thompson married Florence Mary Grant on 11 May 1884 at Chelsea, Suffolk Co., MA. George Ambler Thompson died on 22 August 1957 at Lynn, Essex Co., MA, at age 95. Charles Ambler Thompson was born on 23 November 1903 at Wakefield, Middlesex Co., MA. He was the son of George Ambler Thompson and Florence Mary Grant. Charles Ambler Thompson married Dorothy May Winter. Charles Ambler Thompson died on 18 December 1949 at Saugus, Essex Co., MA, at age 46. Funeral services were held Wednesday, April 15, at 2:30 p.m. at the McDonald Funeral Home for Odin J. Kissinger, a former resident of this community. Harland Johnson was officiating minister. Singers were Ronald King, Bill Miller, Lester Pilcher, and Louis Cool, accompanied by Mrs. Edw. Berndt. Casket bearers were W.F. Yenni, Frank Bundy, Ray Ball, John Brock, Allen Thomas, and Joe Reidmiller. Interment was in Glasco cemetery. Odin J. Kissinger was born in Buchanan County, Iowa, August 15, 1877, and departed this life April 12, 1953, after an illness of several months. Mr. Kissinger spent the early years of his life in Buchanan County, Iowa. On September 1, 1898, he was united in marriage to Nettie Mae Hayes, and together they moved to Glasco, Kansas, where they made their home until her death in the year of 1934. To this union were born ten children, three preceding him in death. On September 19, 1938, he was united in marriage to Mrs. Bertha Kirkendall of Independence, Iowa, and moved to that vicinity where he spent the remaining years of his life. He was a devoted husband and father, and spent his life taking an active interest in helping others. Those to mourn his passing are his wife, Bertha, three daughters, Mabel Smejkal of Glasco, Kans; Floy Gaddis of Long Beach, Calif; Ester Harrell of St. Louis, Mo; four sons, Orin of Stanberry, Mo; Clifford and James of Bald Knob, Ark; and Dean, of Lawndale, Calif; three step-children, Cora Johnson, Ruth Jennings, and Glen Kirkendall, all of Independence, Iowa; 16 grandchildren, 14 great grandchildren and a host of relatives and friends who join the family in their sorrow of his passing. [S807] Find A Grave, online http://www.findagrave.com, Find A Grave, database and images (https://www.findagrave.com : accessed 01 June 2018), memorial page for Odin J. Kissinger (15 Aug 1877–12 Apr 1953), Find A Grave Memorial no. 85967415, citing Glasco Cemetery, Glasco, Cloud County, Kansas, USA ; Maintained by Cheryl White (contributor 47328595) . Louise Placentia Porter was born on 28 November 1885 at Ponca, Dixon Co., NE. She married Raymond Everett Holcombe, son of Albert H. Holcombe and Jane Clark Merwin, circa 1910.1 Louise Placentia Porter died on 27 August 1963 at Whittier, Los Angeles Co., CA, at age 77. [S39] 1920 Federal Census, unknown repository address, Year: 1920; Census Place: Denver, Denver, Colorado; Roll: T625_161; Page: 6A; Enumeration District: 221; Image: 862. Catherine Louise Holcombe was born on 18 June 1910 at Coffeyville, Montgomery Co, KS. She was the daughter of Raymond Everett Holcombe and Louise Placentia Porter. Catherine Louise Holcombe died on 2 May 2002 at Whittier, Los Angeles Co., CA, at age 91. Pvt. Burton William Trout was born on 8 March 1843 at LeRoy, Bradford Co., PA. He was the son of Anddrew V. Trout and Lovica Crofut. Pvt. Burton William Trout married Etta Emmaline Platt on 1 January 1866 at PA. Pvt. Burton William Trout died on 10 May 1916 at Winfield, Cowley Co., KS, at age 73. Mary Helen Holcombe was born circa 1923 at MI. She was the daughter of Raymond Everett Holcombe and Louise Placentia Porter. Mary Helen Holcombe died on 8 June 1939 at Macomb Co., MI. Dorothy Lillian (Cassel) Case, 91, of Simsbury, passed away on Wednesday, January 22, 2014. She was born in Skippack, PA on October 28, 1922. She served in the USMC during WWII, 1943-45, as an Aerographer at the Marine Air Station in Cherry Point, NC where she met her husband of 69+ years, Wesley Lewis Case. Dorothy was retired from Connecticut General Life Insurance Company, a past officer in the Order of Eastern Star, a member of the American Legion Auxiliary, the VFW Auxiliary, and of the Simsbury United Methodist Church. Dorothy was a wonderful person who gave generously of herself and asked nothing in return. She donated generously to the needy whether it was for people in a third world country, abused animals or injured wildlife. She was an avid fan of UConn Women's Basketball who loved bird watching and making jam for her family. She is survived by her husband, Wesley Lewis Case, daughter Barbara Keehbauch and her husband Tom of Griffin, GA, son Lewis Case and his wife Susan of Framingham, MA, son Richard Case and his wife Marilyn of Latham, NY; her grandsons Zachary Case and Nathaniel Case, and cousin Roanne Leclair, her husband Steve and son Noah of Simsbury. Family and friends may call at the Vincent Funeral Home, 880 Hopmeadow Street in Simsbury on Sunday, January 26th from 3:00 PM to 5:00 PM. Funeral service will be held at the funeral home on Monday, January 27th at 11:00 AM. Burial will follow in the Simsbury Cemetery. [S807] Find A Grave, online http://www.findagrave.com, Find A Grave, database and images (https://www.findagrave.com : accessed 02 January 2019), memorial page for Dorothy Lillian Cassel Case (28 Oct 1922–22 Jan 2014), Find A Grave Memorial no. 125370413, citing Simsbury Cemetery, Simsbury, Hartford County, Connecticut, USA ; Maintained by Bob Spalding (contributor 47756429) . Howard Lawrence Marler was born on 16 January 1923. He married Betty Jane Divine, daughter of Nevelyn Kyle Stanley, on 3 February 1968 at Harris Co., TX. Howard Lawrence Marler died on 5 February 1991 at age 68. (?) Burch married Betty Jane Divine, daughter of Nevelyn Kyle Stanley. [S807] Find A Grave, online http://www.findagrave.com, Find A Grave, database and images (https://www.findagrave.com : accessed 05 January 2019), memorial page for Eva A. Powers Holcomb (21 Jan 1858–17 Apr 1941), Find A Grave Memorial no. 100256848, citing Evergreen Cemetery, Pittsford, Rutland County, Vermont, USA ; Maintained by Janet Muff (contributor 46951416) . Richmond Edwin Case was born on 26 April 1828 at Richmond, Ontario Co., NY. He was the son of William Case and Polina Roblee. Richmond Edwin Case married Laura A. Hewings on 8 October 1848 or 8 October 1849 at St. Joseph Co., MI. Richmond Edwin Case died on 23 February 1903 at Three Rivers, St. Joseph Co., MI, at age 74. [S807] Find A Grave, online http://www.findagrave.com, Find A Grave, database and images (https://www.findagrave.com : accessed 06 January 2019), memorial page for Mildred Lucille Gerow Holcomb (22 Sep 1907–7 Aug 2001), Find A Grave Memorial no. 130434206, citing Evergreen Cemetery, Pittsford, Rutland County, Vermont, USA ; Maintained by Annie Duckett Hundley (contributor 47394373) . Franklin Blain Case was born on 30 October 1857 at Constantine, St. Joseph Co., MI. He was the son of Richmond Edwin Case and Laura A. Hewings. Franklin Blain Case married Minnie Frances Houk on 22 April 1886 at Frankfort, Benzie Co., MI. Franklin Blain Case died on 7 February 1921 at Los Angeles, Los Angeles Co., CA, at age 63. [S863] Thomas Owen Griswold, Reeve Griswold Family, page 85. [S807] Find A Grave, online http://www.findagrave.com, Find A Grave, database and images (https://www.findagrave.com : accessed 28 June 2018), memorial page for George Roe Cory (26 Sep 1823–10 Dec 1891), Find A Grave Memorial no. 39411599, citing Coryland Presbyterian Cemetery, Gillett, Bradford County, Pennsylvania, USA ; Maintained by J. Kelsey Jones (contributor 47370830) . [S807] Find A Grave, online http://www.findagrave.com, Find A Grave, database and images (https://www.findagrave.com : accessed 28 June 2018), memorial page for William M Cory (11 Dec 1794–3 Jul 1881), Find A Grave Memorial no. 34726334, citing Coryland Presbyterian Cemetery, Gillett, Bradford County, Pennsylvania, USA ; Maintained by J. Kelsey Jones (contributor 47370830) . [S807] Find A Grave, online http://www.findagrave.com, Find A Grave, database and images (https://www.findagrave.com : accessed 28 June 2018), memorial page for Elizabeth Maria Roe Cory (15 Oct 1800–6 Jan 1872), Find A Grave Memorial no. 34726382, citing Coryland Presbyterian Cemetery, Gillett, Bradford County, Pennsylvania, USA ; Maintained by J. Kelsey Jones (contributor 47370830) . 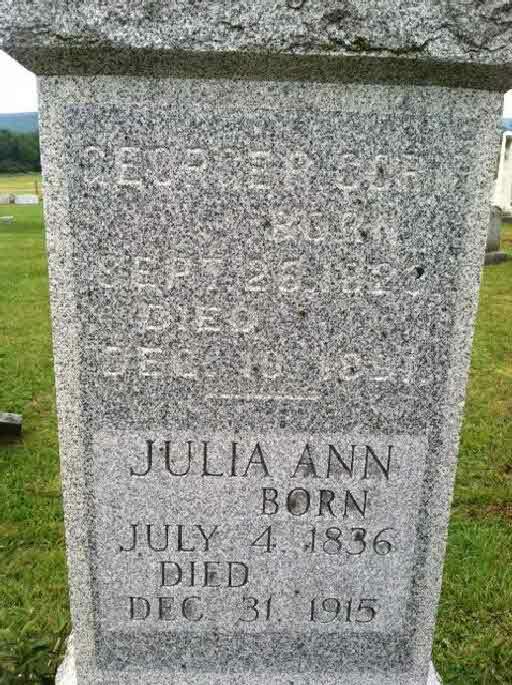 [S807] Find A Grave, online http://www.findagrave.com, Find A Grave, database and images (https://www.findagrave.com : accessed 28 June 2018), memorial page for Julia Ann Dunning Cory (4 Jul 1836–31 Dec 1915), Find A Grave Memorial no. 39411616, citing Coryland Presbyterian Cemetery, Gillett, Bradford County, Pennsylvania, USA ; Maintained by J. Kelsey Jones (contributor 47370830) . [S863] Thomas Owen Griswold, Reeve Griswold Family, page 87. [S336] Ancestry.com, Ancestry.com. New Jersey, Deaths and Burials Index, 1798-1971 [database on-line]. Provo, UT, USA: Ancestry.com Operations, Inc., 2011. "New Jersey Deaths and Burials, 1720–1971." Index. FamilySearch, Salt Lake City, Utah, 2009, 2010. Index entries derived from digital copies of original and compiled records. [S807] Find A Grave, online http://www.findagrave.com, Find A Grave, database and images (https://www.findagrave.com : accessed 28 June 2018), memorial page for Job Cory (unknown–28 Mar 1821), Find A Grave Memorial no. 7195859, citing Sparta Cemetery, Sparta, Sussex County, New Jersey, USA ; Maintained by Rich H. (contributor 46489213) . [S863] Thomas Owen Griswold, Reeve Griswold Family, page 93. [S863] Thomas Owen Griswold, Reeve Griswold Family, page 95. [S863] Thomas Owen Griswold, Reeve Griswold Family, page 105. DIED. Cory. - In Columbia, Pa., July 3d of cholera morbus, William M. Cory, aged 87 years. 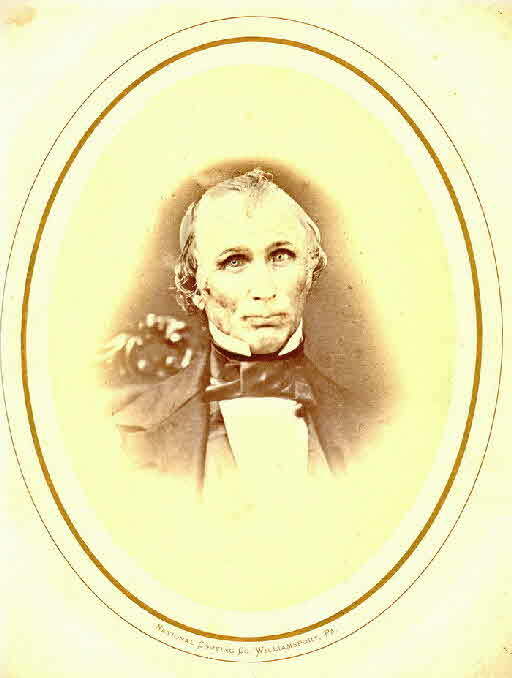 He was born in Sparta, N.J., he married Miss Elizabeth M. Roe, in 1820, who died after 52 years of wedded life. Of their eight children 5 remain (The Northern Tier Gazette, Troy, Pennsylvania, Thursday, July 14, 1881). [S863] Thomas Owen Griswold, Reeve Griswold Family, page 111. Jean C. (?) was born on 29 July 1924. She married Levester C. Messenger, son of Charles Edwin Messenger and Carolyn M. Luther, in 1944. Jean C. (?) died before 2019. David C. Cory was born in 1825. He was the son of William M. Cory and Elizabeth Maria Roe. David C. Cory died in 1890. Born in Stamford, Connecticut and long-time resident of Marvin Beach, in Norwalk Connecticut, Eileen was above all a loving and caring wife, mother and grandmother. She worked as a legal secretary and assistant to the principal of West Rocks Middle School for more than twenty years. Eileen is pre-deceased by her loving husband of forty-nine years, Benjamin “Ben-O” Holcomb. She is survived by her children Glenn and Amy Holcomb, Robert and Mona Holcomb, Douglas and Dialtha Holcomb and Elizabeth and Walter Forger and her many beloved grand children; Casey, Katherine, Sean, James, Alison, Benjamin, Ryan, Lauren and Sarah. She passed surrounded by those who loved her and recollecting a beautiful and blessed life. While the impression she left on those she touched will forever be a part of us, she will be sadly missed. A Mass of Christian Burial will be celebrated Friday, February 8 at 10:00 a.m. at St. Stephen Church, 6948 Main Street, Trumbull. Burial will take place at Resurrection Cemetery, 208 S. Main Street, Newtown. Relatives and friends may greet the family on Thursday, February 7 from 4-8 p.m. at the Spadaccino and Leo P. Gallagher and Son Community Funeral Home 315 Monroe Turnpike, Monroe. Online condolences may be made at SpadaccinoFuneralHome.com. [S807] Find A Grave, online http://www.findagrave.com, Find A Grave, database and images (https://www.findagrave.com : accessed 10 February 2019), memorial page for Eileen M Holcomb (6 Sep 1931–30 Jan 2019), Find A Grave Memorial no. 196693601, citing Resurrection Cemetery, Newtown, Fairfield County, Connecticut, USA ; Maintained by Erin Nikitchyuk (contributor 47811589) . John and Emily both immigrated in 1907 and were naturalized in 1919. They were enumerated in the 1920 New Trier, Cook Co., IL, federal census. He was a government upholsterer age 35, she was 39. Children in the household, all born in Illinois, were Peter M. 8, Margaret 7, and Ida J. 1 year 4 months. John and Emily were again eunmerated in the 1940 New Trier federal census. He was a business owner. The only child in the household was Ida. Natalie Wilson was born on 26 November 1877 at Wilmington, New Castle Co., DE. She married Lammot du Pont II. Natalie Wilson died on 5 April 1918 at Wilmington, New Castle Co., DE, at age 40. Peter M. Gianesin was born on 17 August 1911 at IL. He was the son of John B. Gianesin and Emily Long. Peter M. Gianesin was also known as Pietro Michele Gianesin. [S418] Ruth Cost Duncan, John Case 2nd Edition, page 135.